The Interpretive Guides Association is supported by over 300 active members, a volunteer board of directors, a part-time executive director, program coordinator and financial assistant. We welcome anyone who would like to share their ideas, passion and zest for interpretation to contact us or get involved in the association. Jeff Douglas President “I grew up in Nova Scotia, foot steps away from Kejimkujik National Park. Having spent my childhood playing in the fresh air whether it was canoeing, hiking, swatting mosquitoes or cross country skiing, I knew being outside was a must. I studied Outdoor Recreation at Nova Scotia Community College after high school, followed by one year of living in Halifax working for Hewlett Packard which cured me of any aspirations of office work. In 2005 an opportunity working as a bellman for the Fairmont Chateau Lake Louise was scene as an offer to get some much wanted mountain experience and he left the ocean behind. 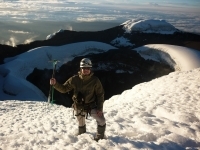 Dave Holder, Past President Dave began his mountain instruction career while serving with the Royal Engineers (British Army) where he was trained as a Mountain Expedition Leader, Biathlon coach, Orienteering coach, climbing supervisor and Rock leader. Leading groups around the world to Britain,Iceland, Norway, Africa, Belize and the USA his journeys led him to Canada where he met his wife Brenda. Marraige, retirement from the military, and Immigraton quickly followed. He currently works with his wife’s company, Mahikan Trails. He is accredited by the ACMG as a Backpacking Guide and the Interpretive Guides Association as a Professional Interpreter. His other Canadian qualifications include: Nordic ski instructor with CANSI, Cave rescue training with BC cave rescue, survival Instructor with Mors Kochanski (author of Northern Bushcraft), Interpretation Canada Training Program, Canoe Instructor and First Aid Instructor. Tracey Gage, Executive Director Tracey has degrees in Wildlife Biology and Geography from Guelph University and has her teaching degree from Lakehead University in Thunder Bay. 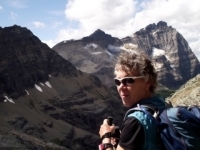 She has worked as a researcher an educator and a guide since 1990 and has been in the Canadian Rockies since 1997. Since her move to the Rockies, she has worked as a backcountry guide, interpretive guide, manager of an interpretive guiding program and an operations manager in the destination management field. Her strengths lie in training and coaching guides in the theory, knowledge and spontaneity of the interpretation field. Tracey loves the mountains and what the Bow Valley has to offer to locals and guests alike. She is an accredited Professional Interpreter and has gone through the ACMG hiking guide training. Tracey has been actively involved with the Interpretive Guides Association since 2004 and is excited to continue supporting and representing guides in the Mountain National Parks. Rod Plasman, Admin Assistant Rod has been a resident of the Bow Valley for 20 years and has led a varied life during this time. When he first moved here, he commuted to Calgary and worked in IT. After 5 years he found himself managing the IT Department at the Town Of Banff. Rod moved to the Bow Valley for the life style. While working full time in IT, he also became very involved with the Alpine Club of Canada at both the National and Section level. His volunteer activities include being on various Executives, leading summer and winter trips and managing ski camps. Rod started teaching outdoor skills to other ACC volunteers and discovered that he really enjoyed teaching. He expanded some of these courses and they are now offered to the public as well as IGA members. In 2000 Rod developed a program to teach skiers how to back country ski. The program known as the BIT Program has been offered now for 12 years and is highly successful. After working for 20 years in IT, Rod decided that he had spent enough time behind a desk and signed up for the Apprentice Hiking Guide course with the IGA and has been working as a guide since then. This varied background has given Rod a broad base of skills that he can use in his role at the IGA. Look for Rod in the backcountry skiing in the winter or exploring in the summer. Joe Urie, Vice President Joe arrived in Jasper in 1988 and other than a stint in the Yukon, has lived there with his wife and three children ever since. He is a member of the Metis Nation of Alberta and his family’s history can be traced along the length of the Athabasca River, from the birth of it near his home in Jasper, to its end in Fort Chipewyan, for nearly 150 years. When he is not guiding, Joe likes to trail run. He fancies himself a modern day “Coureur des Bois”. What would you be if you didn’t dream? Morag Mottram, Treasurer Morag was born in Edinburgh; Scotland spent a larger part of her life in Toronto and moved to the Bow Valley in 2004. While packing up her home in Toronto she discovered a long forgotten Grade 9 geography project that she completed on Banff and knew she was heading west for a reason. Banff National Park had always been in her thoughts and dreams and it was at this point that she realized she was meant to live in the Bow Valley. She has been involved in the fitness industry since 1992 managing fitness facilities and teaching classes throughout Banff and Canmore. 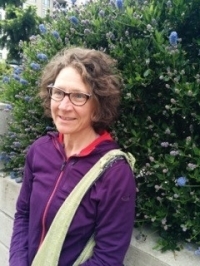 While working for the Banff Springs Hotel fitness facility Morag started leading hikes and ran nature-based programs for various groups visiting the area. In 2009, Morag became a member of the IGA and took the PI courses in 2011. Morag’s hobbies include hiking, kayaking, cycling, cross country skiing, reading, photography, and baking and is truly delighted to be able to share the joys of “living in a postcard” with visitors to this area. Anne was born and raised in Montreal, Quebec. She moved to the Canadian Rockies in 2011, while studying tourism management in Montreal. She took an internship as a guide in the mountains hoping to get experience to one day become a city guide in Europe but the mountains took hold and she never looked back. She has worked as a hiking guide, bus tour guide and guide on boat tours, but her favourite part of what she does is teaching other guides about this profession and the natural landscapes surrounding them. Anne’s speaks both French and English and teaches in guides in both languages as well. Adele Laramee, Director At Large For more than 25 years I have lived and worked in the Rocky Mountain Parks, inspired by a stunning environment to explore, learn and share my passion for place with visitors from around the world. Early on I landed a job in interpretion with Jasper National Park and leading hikes and tours in the winter in the private sector. After four years in Northern Parks setting up a backcountry interpretive program in Nahanni National Park, I found my way back to the Rockies to coordinate the Interpretive Program in the Lake Louise, Yoho and Kootenay Field Unit of Parks Canada. One of my greatest joys over the years has been to build a supportive environment for interpreters to grow and develop knowledge and skills that enable them weave together stories and visitor experiences in meaningful ways that connect people to place. I couldn’t have imagined a better career! I’m excited to be on the board of the Interpretive Guides Association. Working with passionate people to provide strategic direction for an organization that makes a difference seems like a very worthy endeavor. Thanks for the opportunity!